Finally onto my first fall/winter project with this easy beginner hat! I love being able to wear hats when the weather cools down because my hair never looks brushed, and a hat helps me look more put together, ha! 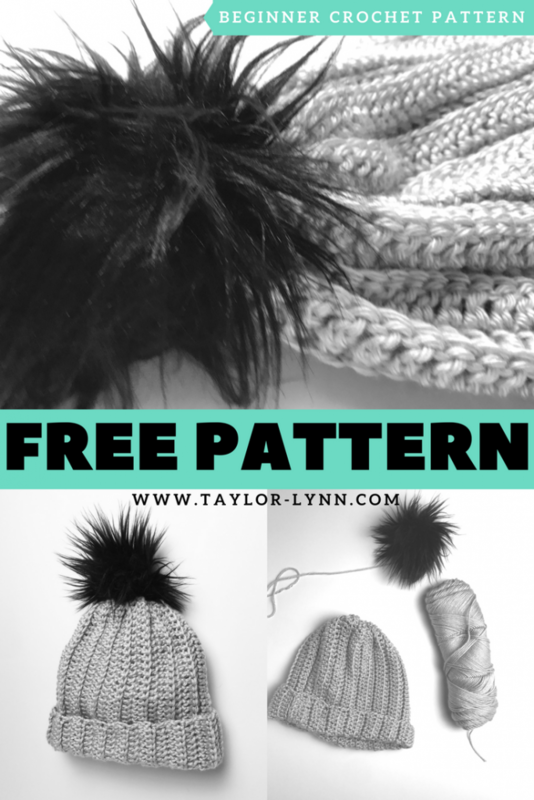 This hat is so easy to make, it is the perfect beginner project for a new crocheter. It is so easy to make, you could work on it while watching tv and hook up a few in no time. It took me half a skein of carons simply soft meaning that for less than $3, I could make two hats. That leaves a lot of room for profit if you plan on selling these! I put the links to my facebook and instagram accounts below, I love being able to see your finished projects. Tag me and I may feature your project on my social media accounts! If anyone has a suggestion for any new patterns feel free to tag me or DM on my instagram at anytime. Also if you get stuck on a pattern at any time, I usually have a quicker response time if you contact me on those two social media forums. Thanks guys! 6mm crochet hook, I use this one! These scissors are the ones I use and keep in my crafting bag. They are super sharp and compact enough to carry with me and my projects! 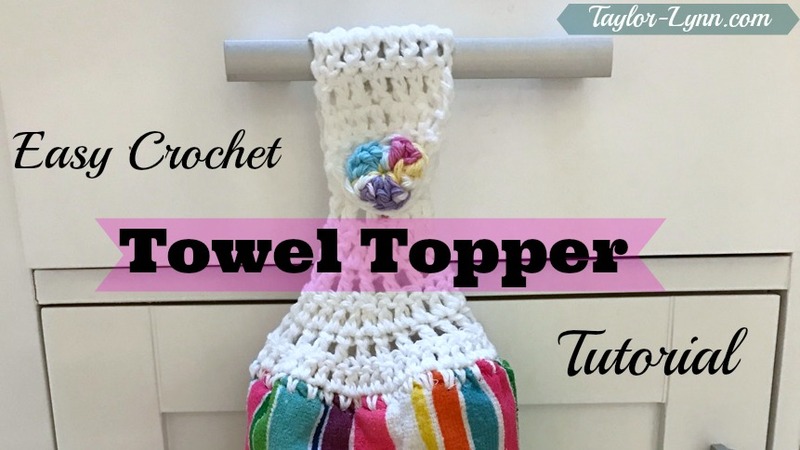 If you love this beginner crochet hat pattern you also may be interested in checking out my beginner towel topper pattern, which has a video tutorial to go with it! They make great gifts for family and friends and they are inexpensive to make! Row 1: DC in the 4th CH from hook. Do 1 DC in each CH all the way across. Row 2: CH 2 and turn. (CH 2 does NOT count as first DC). Complete a BLO-DC in each stitch across, but perform a regular DC in the last ST of the row. Check out the tutorial in the “Stitches used” section if you have question on how to do a BLO-DC. Row 3-34: Repeat row 2 for the next 32 rows. Tie off leaving approximately a 20″ tail that you will use to sew your edges together and to close the top of your hat. SS the edges together starting from the bottom and working your way up forming your project into a tube. Once you have reached the top, tie a knot to secure the tail, but do not cut. With your remaining tail use your yarn needle to weave in and out of the stitches at the top of the “tube”. Pull tight, tie off, weave in ends and cut yarn. Fold inside right and that is it! This beginner crochet hat look great as is and is UNISEX, but who doesn’t love a good pom to top it all off? 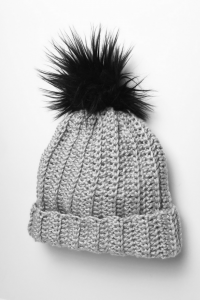 You could use a Fur Pom (which are absolutely my favorite!) or you could use a contrasting color of yarn and make your own little yarn pom! Pom Attachment: If your pom has a tail of yarn attached to it already used that to attach. 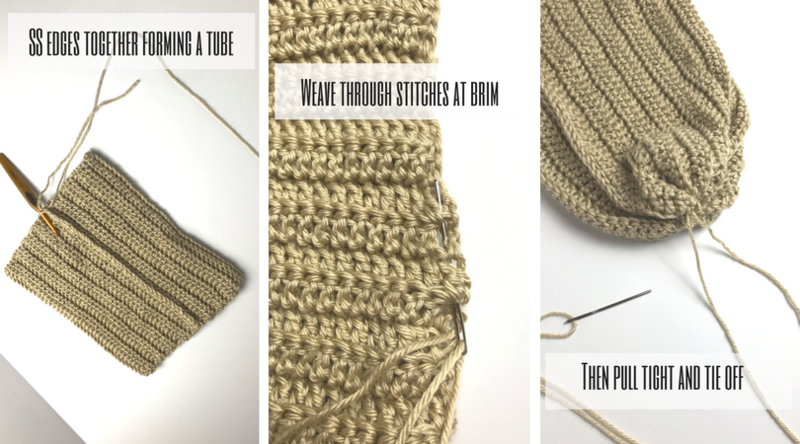 You will want to have the pom on the right side of the hat and use your yarn needle to whip stitch the pom to the top of your hat. Go around 5-6 times, tie off and weave in ends. If you want it to be extra secured, use a needle and thread and stick it through the bottom fabric of your pom and sew it onto your hat. DO WE LOVE IT OR DO WE LOVE IT? Easiest and cutest beginner crochet hat ever right?! That is my total unbiased opinion of course, but I’m sure you feel the same way now that you completed your own right 😉 If you have ANY QUESTIONS about this beginner crochet hat pattern, or about anything at all honestly, please please leave me a comment below and I will get back to you ASAP! Also, if you would be willing, I would love for you to share your finished projects (and you wearing them!) on my blog’s Facebook Page! Or if you post on instagram tag me (@TaylorLynnCrochet) so I can see how awesome they turned out! The social media icons in my header and side bar are all linked right to all of my accounts! Thank you so much! If you have any suggestions for future or tutorials please comment below! Hi Taylor, I make baby hats to donate to hospitals…but I’ve seen so many patterns that are made like this pattern, I’m going to try this pattern as I always start from the top down….do you have an idea how many I would chain for a newborn size? Thank you for your help! PS. 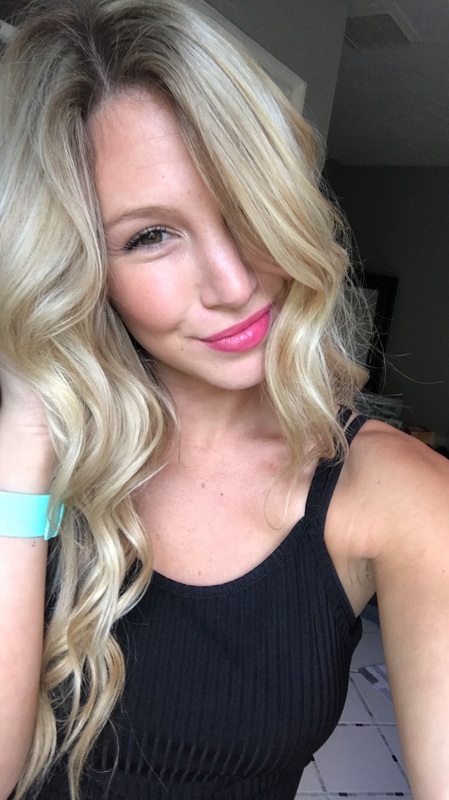 My daughter’s name is Tayler, too! Great name! I am not sure how many to start but if you google “baby hat size chart” there will be some charts that will show how high a hat should be and you can make your chain that height!